SVMK Inc. (the parent company of SurveyMonkey), the leading provider of SaaS survey products, filed for a $100M IPO. The company plans to trade on the NASDAQ exchange under the symbol “SVMK” and J.P. Morgan is leading the offering. 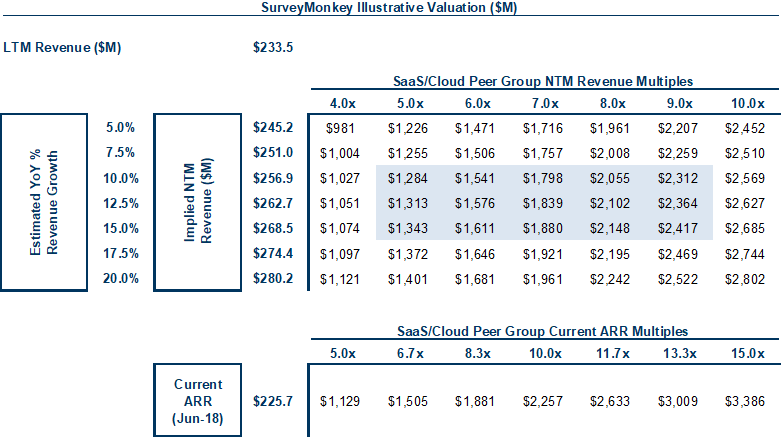 SurveyMonkey will be the 14th SaaS/cloud IPO this year. The company’s mission is to “power curious individuals and organizations to measure, benchmark and act on the opinions that drive success.” SurveyMonkey has reached significant scale and through their customers, they generate on average more than 20 million answered questions a day in almost 200 countries across a wide range of use-cases, including collecting NPS scores, employee engagement, gathering feedback from customers, and market research, among a variety of other use-cases. SurveyMonkey utilizes a self-serve business model where 80% of new individual paying users come to them directly through their website or through organic search. While the products are very easy to use and deploy, hence attracting individual users with credit cards, the company believes 80%+ of paying users utilize their products for business purposes across SMBs → large enterprises across all sectors. The company also has varying pricing tiers that serve both individuals to large enterprises. Since SurveyMonkey’s founding, they have attracted over 60M+ users to their platform and 16M+ users were active within the past year. Of those, 616,000 were paying as of June 30th, 2018. Cumulatively, ~47B questions have been answered on their survey platform by over 5B survey respondents. SurveyMonkey was founded in 1999 and is based in San Mateo, CA. The company has 761 full-time employees. In 2017, SurveyMonkey generated over 90% of revenue from sales of subscriptions to their products, and over 75% of revenue was from individuals and organizations that were customers in 2016, with the remainder coming from new customers. Individual paying users can choose between monthly or annual subscriptions, and as of Q2'18, ~75% of those customers were on annual subscriptions paid in advance. No customer represented more than 1% of revenue in any of the periods presented. Tiger Global, which is the largest shareholder in the company, was also the company’s largest customer in 2015, 2016, and 2017 at $1.2M, $1.8M and $2.1M in revenue, respectively. A study SurveyMonkey conducted in 2017 showed that 45% of business users who utilize online survey software consider SurveyMonkey to be their survey platform of choice, nearly double the second most recognized alternative, a lightweight tool, and nearly seven times the third-most recognized alternative, an enterprise feedback software application. SurveyMonkey has 616,000 paying users as of Q2'18 across 300,000 organizational domains, including paying users in 98% of the Fortune 500, 71 of which have an organizational agreement. As of Q2'18, over 85% of annualized revenue was from domain-based customers, which are customers who register using an email account with an organizational domain name, such as @surveymonkey.com, and excludes customers with email addresses hosted on widely used domains such as @gmail or @outlook. 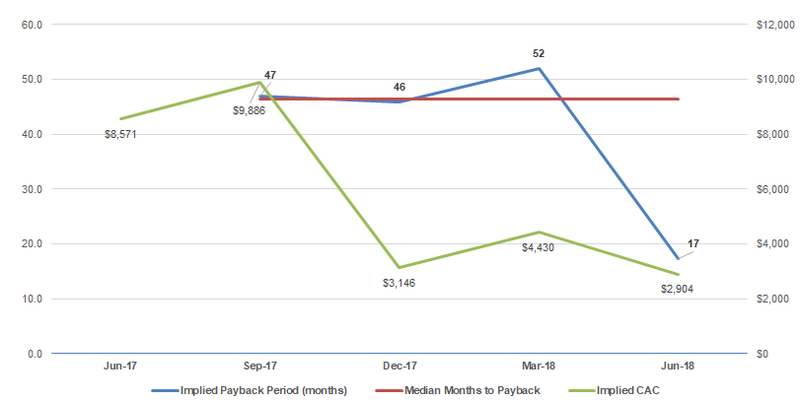 As of Q2'18, ~30% of employees had been with the company for less than 1 year and ~20% for more than one year but less than two years. In 2017, 35% of revenue was from customers outside the U.S.
SurveyMonkey’s organizational dollar-based net retention rate has consistently been above 95%. Their dollar-based net retention rate for individual users that had an annual subscription to their products, or individual dollar-based net retention rate, has consistently been above 80%. 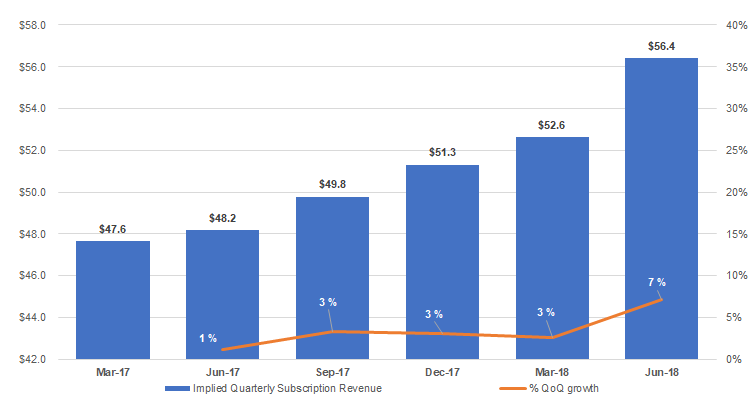 Since the beginning of 2017, the annualized revenue from new sales of the SurveyMonkey Enterprise plan have represented an ~4x increase over the total annualized revenue from the individual paid subscriptions from those organizational domains over the prior 12 month period. The company has incurred substantial indebtedness, and as of Q2'18, their total aggregate indebtedness was approximately $322M of principal outstanding. SurveyMonkey utilizes a self-serve GTM that is driven by the inherent viral nature of the product, awareness and broad adoption, enabling the company to acquire users efficiently. SurveyMonkey then focuses on converting free users to individual plans and paying individual plan users to organizational or enterprise agreements. The company has built an internal software product called Customer 360 that analyzes customer usage, patterns and signals that they use to identify opportunities to convert active free users to paid, upsell to enterprise-wide agreements, and expand existing enterprise customers through upsell and cross-sell. Historically, their sales force has been limited but are focused on expanding it now. Pricing for individual plans is user-based and pricing for enterprise plans is based on users and functionality. Pricing starts at $37/month for individuals. Below is an output which has some of the company’s pricing and tiers. SurveyMonkey Self-Serve: Offers various plans for individual users where users sign up with a credit card in 3 plans — Standard, Advantage, and Premier. Standard plans can be paid monthly or annually and Advantage and Premier plans are only available on an annual basis. All individual plans offer access to partner integrations, APIs, as well as 24/7 support. 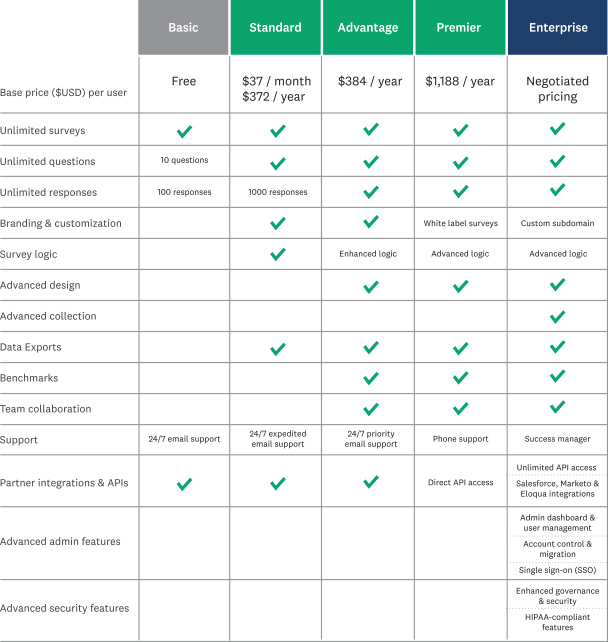 SurveyMonkey Enterprise: Enterprise-grade solution that can support organizations of all sizes and is priced on the functionality and the number of users. It offers collaboration features, managed accounts and users, and integrations into solutions like Salesforce, Marketo, Oracle, Microsoft, Google, and Slack*. Their customers have created ~17,000 apps using their APIs in sales and marketing, productivity/collaboration, social and analytics. It also has enterprise-grade security features. Customers (SurveyMonkey CX) Customer experience and NPS solution that enables companies to gather customer feedback and helps companies turn it into actionable insights. (TechValidate) Marketing contact automation solution that generates “voice of the customer” content to showcase and leverage customer successes. Employees (SurveyMonkey Engage) Employee engagement offering which measures employee experiences and sentiment. 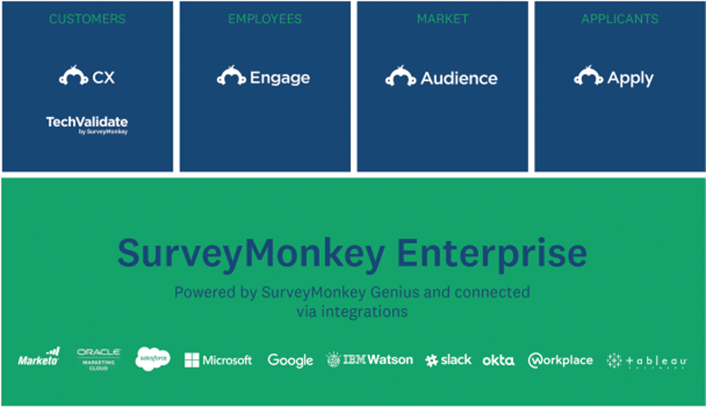 Markets (SurveyMonkey Audience) Market research solution powered by their proprietary panel of more than 1.4M U.S. consumers. Applicants (SurveyMonkey Apply) Application management solution that is primarily used by educational institutions and non-profits seeking to allocate scholarships and grants. Form-Based Application (Wufoo) Easy-to-use form builder that helps users create web and mobile forms. Users frequently leverage Wufoo to power their websites’ contact forms, enable lead generation and create event registrations. SurveyMonkey believes their U.S. market opportunity to be $25B and their global market opportunity much larger. They get to this number by multiplying the total number of U.S. knowledge workers (U.S. Bureau of Labor Statistics) by their annual average revenue per paying user. 35% of their revenue is outside the U.S. so they think they can tap the large international market too. Additionally, the company believes they touch the customer experience management, talent management, and market research software markets, which represent $6B (MarketsandMarkets 2017), $7B (Technavio 2018) and $45B (ESOMAR 2016), respectively. SurveyMonkey competes with a variety of other software solutions and approaches. The company calls out Google, Qualtrics, and Medallia as well as full-service market research firms. Additionally, they compete with other approaches such as pen-and-paper surveys, telephone surveys, and emails. They could see more competition as they add new products too. For example, companies like Glint and CultureAmp have employee engagement offerings, which compete with SurveyMonkey Engage. Qualtrics is rumored to be thinking about an IPO soon as well. According to Pitchbook, the company has raised $315M to date from investors including TPG Growth, ICONIQ, Spectrum, Bain Capital Ventures, Tiger Global, Google Capital, Salesforce Ventures, Social + Capital, T.Rowe Price and others. 5%+ pre-offering VC shareholders include Tiger (29.3%) and Spectrum (8.4%). Zander J. Lurie, CEO, is at a 3.1% pre-offering stake. The company raised their last round of $250M in December of 2014 at a $2B post-money valuation, according to Pitchbook. Facebook COO Sheryl Sandberg’s trust owns a 9.9% pre-offering stake. Sandberg is the widow of Dave Goldberg, who was CEO of SurveyMonkey for 6 years until his death in 2015. Sandberg has said she plans to donate her shares to the Sheryl Sandberg and David Goldberg Family Foundation. It’s worth noting that in 2016 and 2017 the company went through a restructuring to focus more on their core products, increase efficiency and reduce costs. In March 2016 the company implemented a plan to reduce sales and marketing headcount and closed several international offices, which was primarily related to their decision to cease offering the non-self serve portion of their SurveyMonkey Audience solution. In late 2017 and in conjunction with their new Chief Sales Officer, they centralized their sales team in their San Mateo headquarters. The company recognized restructuring charges of $27.2M from 2016 through 2018. 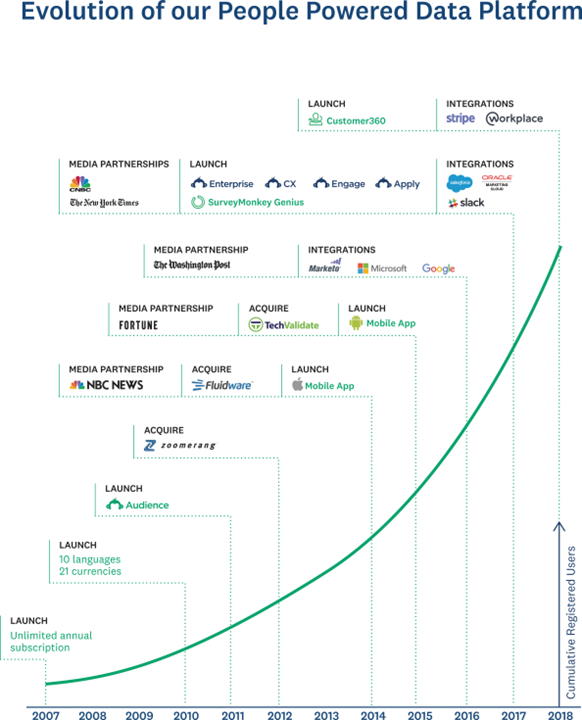 SurveyMonkey has also made various acquisitions to grow and expand their footprint. Examples include MarketTools (Zoomerang) which broadened their self-serve customer footprint, Fluidware which accelerated their technology expertise within the enterprise and further diversified geographic coverage, and TechValidate which expanded their purpose-built solutions and sales capabilities. 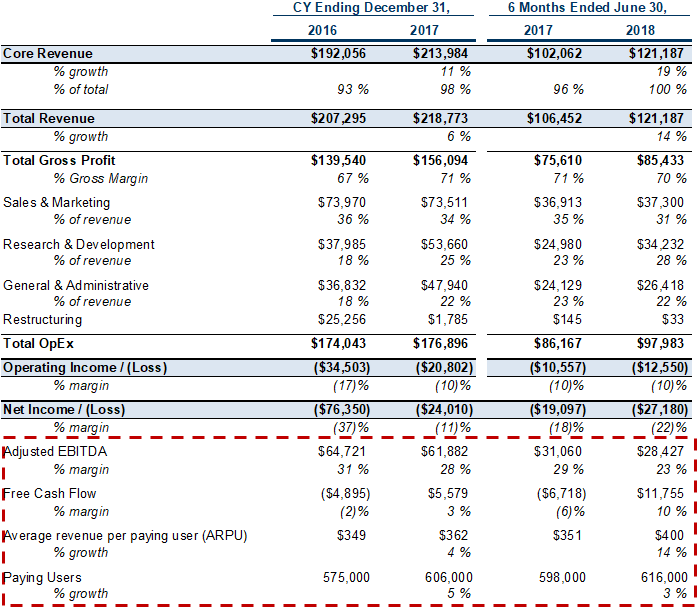 SurveyMonkey has recently accelerated their revenue growth and as of last quarter grew revenue 17% YoY. Gross margins are above 70%. Interestingly, much of the growth in the business has come from pricing increases. 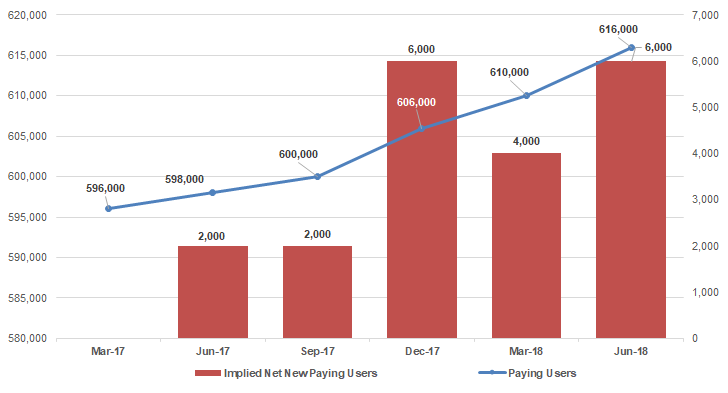 For example, for the first 6 months of 2018, ~80% of the increase of revenue was due to the increase in ARPU (average revenue per user), while ~20% was due to the increase in paying users. In 2017 the company changed their plans and offered paying users more functionality and required users to renew at higher prices. The new sales strategy seems to be working and it’s likely the company was under-optimized before those pricing changes and the GTM restructuring the company went through. For example, over the past 5 quarters paying users have increased by 3% but CAC has fallen by 66%, with ARPU increasing by 17%. CAC is defined as sales and marketing spend over new paying users. Given the 16M+ active users and that most have enterprise domains, SurveyMonkey has a large pool of potential customers to mine from. The enterprise business has more attractive retention characteristics given the 95% net dollar retention, while individual annual paying users is above 80%. That same number from users paying monthly is likely much lower but it’s not disclosed. The company has $43.4M in cash on the balance sheet and $322M of debt. The company will use part of the proceeds from the IPO to pay down their debt. 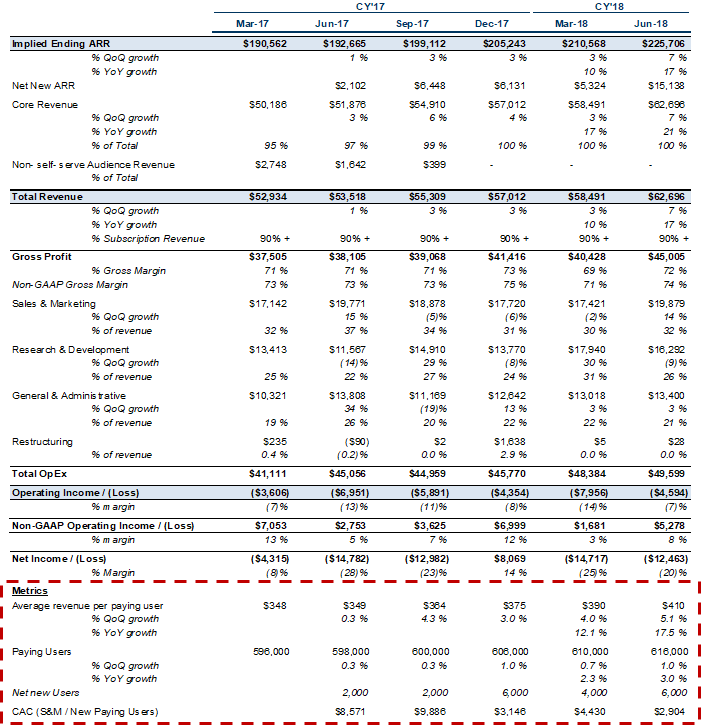 Outputs of other financials and metrics are below. 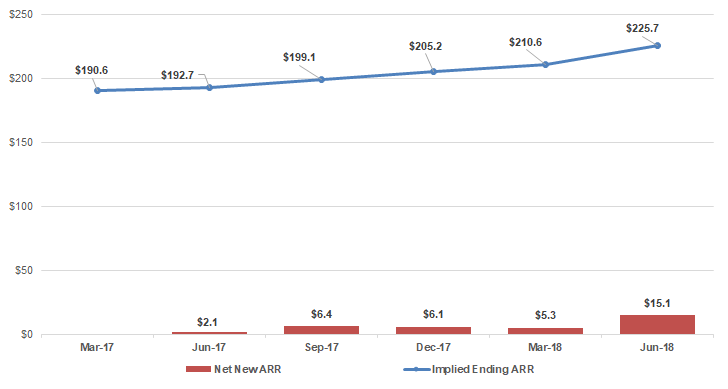 SurveyMonkey has added $33.0M of net new ARR over the past year and $15.1M in the last quarter. The output below charts the quarter-over-quarter growth rates for paying users, ARPU, and implied ARR. As stated above, much of the growth is coming from SurveyMonkey increasing prices (and likely moving further up market where they can charge more per user). ARPU is up 18% over the past 6 quarters. 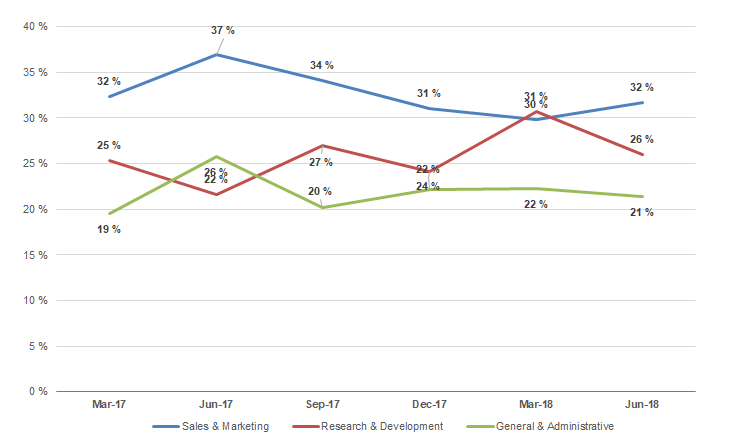 SurveyMonkey utilizes a self-serve GTM and their spend on sales and marketing has been dropping slightly as a percentage of revenue over the past few quarters. The output below has their implied months to payback using their CAC ratio (implied net new ARR * gross margin / sales and marketing spend of prior quarter). Their CAC ratio and actual CAC (sales and marketing spend over new paying users) have been coming down and their sales efficiency is improving. 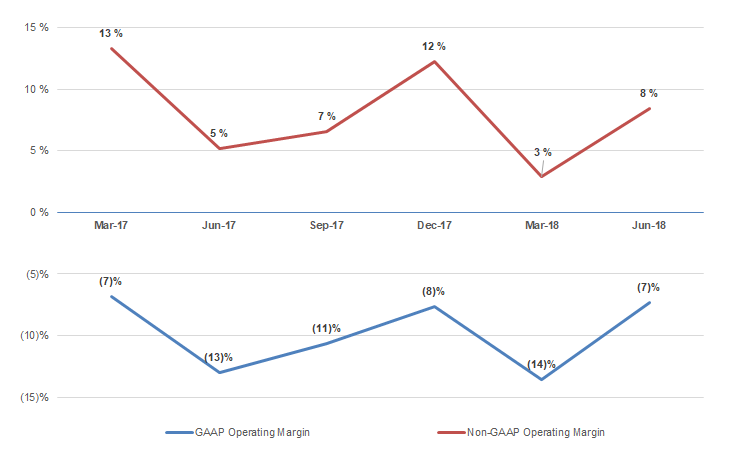 SurkeyMonkey is growing slower than many of the other software IPOs this year, but they do generate non-GAAP operating income and have almost 25% Adjusted EBITDA margins, and had a 10% free cash flow margin in the first half of 2018. With that said, an NTM (next-twelve-months) revenue multiple is a safe assumption to use as a valuation method. The output below has an illustrative range of NTM revenue figures as well as SaaS/Cloud peer group multiples. Additionally, the graphic below has valuation based on their current implied ARR against other public SaaS companies. SurveyMonkey is another example of how software companies can be successful with a self-serve business model. Only now at $200M+ in ARR is the company investing in a sales force to mine their large and growing user base. The product is easy to use and viral in nature and the company will want to draw parallels between their business and that of other successful companies utilizing a self-serve GTM (go-to-market) during their roadshow, similar to a Dropbox or Atlassian. Public market investors will want to better understand if the growth is sustainable (apart from pricing increases) and how the company can take advantage of their broad appeal and brand recognition to garner more enterprise engagements. Lastly, the company might be the only business to have an actual survey in their S-1 to garner feedback from prospective public markets investors (page 101 of the S-1). Congrats to the company and team for building a great business and looking forward to seeing them as a public company. *Note: I work for Spark Capital and we’re investors in Slack.